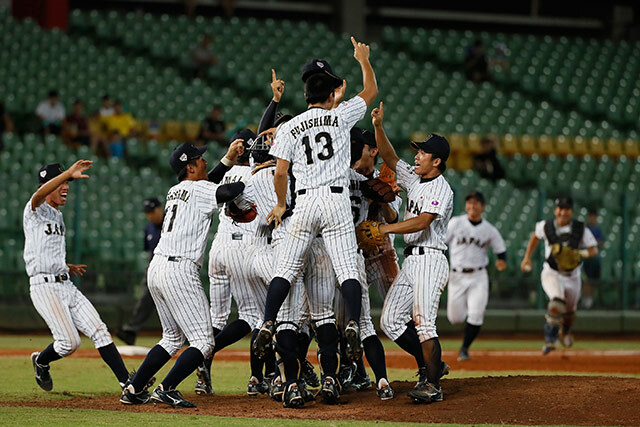 In an intense pitching duel last night, Japan’s Tatsuya Imai and Mizuki Hori combined on a one-hit shutout to prevail over Taiwan 1-0 as the young Samurai Warriors captured the title at the 11th Baseball Federation of Asia (BFA) Under-18 Championship at Taichung’s Interncontinental Stadium. The Japanese team had five hits against Taiwanese starter Teoh Si-kai and reliever Weng Wei-chun, edging the hosts with a rally in the sixth inning. In that crucial frame, Teoh lost control and issued two walks after one out, and Weng came on as relief. Facing two outs, Japan’s eighth batter, Daichi Osame, delivered when he slapped a single to outfield, which drove the runner from second base to break the scoreless deadlock. It was a valuable single run, as Imai and Hori battered Taiwanese hitters through the game with their mix of fastballs, sliders and curves, with the hosts only able to get a hit in the fourth inning. Taiwan put a man on base through a Japanese fielding error in the top of ninth, with fans clamoring for more hits to get a chance to win the game. However, the left-handed Hori settled down to get the next fly out, then got the final batter on a called strike to end the game. As Japanese players rushed onto the diamond to celebrate, Taiwan’s head coach Tsai Ming-tang showed his anger by yelling at the home-plate umpire to dispute the third strike call. It appeared an unsportsmanlike display as Taiwan ended up on the losing end, but it was a deserved result, as Japan played an outstanding game and outpitched Tsai’s side. In the third-place playoff yesterday afternoon, South Korea showed no mercy against China, piling up seven runs in the opening frame on the way to a 14-0 victory. Chinese starting pitcher Tsao Zhengching got knocked out of the game early when four straight South Korean hitters reached base in the first inning. It went downhill from there, as the South Korean line-up rattled the next two Chinese pitchers, Tao Li and Sang Yang, to post more runs on the scoreboard. South Korean power-hitter Lee Jung-hoo, also known as the “Son of Wind,” had a stellar outing by going 3-for-4 with four RBIs in the game. Lee was rated as the best South Korean player in the tournament, with 14 hits in 27 at-bats for a batting average of 0.519, driving in a total of 12 runs in games last week. Leading hitter: Taiga MATSUO (JPN), Most runs batted in: Yuki NAKABAYASHI (JPN), Most home runs: Baekho KANG (KOR), Pitcher with best won-loss average: Naruki TERASHIMA (JPN), Most Valuable Player: Daichi OSAME (JPN), Pitcher with best earned run average: Naruki TERASHIMA (JPN), Most stolen bases: Nattapat UAMWILAI (THA), Most runs scored: Kim Seong YOON (KOR), Outstanding defensive player: Ryuhei KAKI (JPN).